Weiber manufactures vacuum tray driers for drying of thermal sensitive materials which get easily resolved, polymerized or deteriorated under higher temperature. Heat sensitive materials can be driedat low temperatures under vacuum, since the environmental pressure is reduced below the vapour-pressure of the contained water or solvents. Oxidation or Contamination by Air is eliminated. HollowFibers, Medical Devices, Chemical Salts, Fine Chemicals, Dyes, Glandular Products, Pharmaceuticals andFood Extracts (Gluten, Glues, Pepsin), Rubber Explosive, etc. are ideally suited for drying in this manner. Drying under vacuum is also environmentally friendly because the Evaporated Solvents can easilybe re-condensed. These solvents can then either be recycled or disposed of without any problem. The oven is connected to a vacuum pump to create vacuum environment. At an pressure of ab out 0.03 to 0.06 bar vacuum tray dryer is operated (different pressure levels are adjusted for different applications.). the water boils at low temperature due to formation of vacuum, so evaporation of water takes place fast and the materials kept are dried. 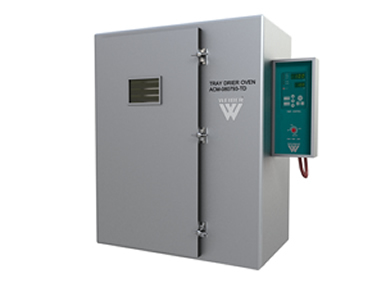 WEIBER Vacuum Tray Dryers are double walled convection heated and cooled units. Outer body are constructed out of thick PCRC, pre coated corrosion resistant GI sheet duly pre-treated with primers and rust proofing and painted with long lasting stove enamel or elegantly powder coated. The inner construction is of stainless steel sheet of SS-304 grade). The gap between the walls is filled high grade mineral glass wool, which ensures maximum thermal efficiency in our ovens. The temperatureof Ambient + 5°C to 350°C is maintained in the oven which is controlled by nanotechnology based microprocessor controller (HMI+PLC as an option).